If you've always hankered after a 'boutique' hot-rod, bolt-on but couldn't afford one, now you can. A real journeyman's guitar. Recommended. Design; build; quality parts; very versatile sounds. 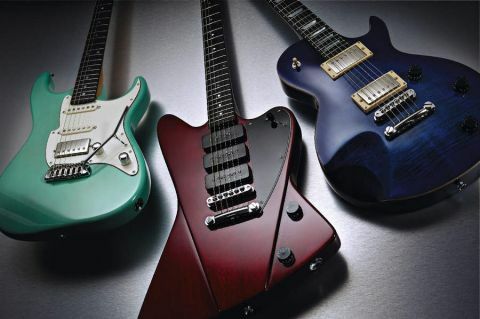 Fret-King's new range with the Super 60HB (far left). The Super 60 HB features a Wilkinson-designed, nickel-covered PAF-alike. The Super 60 HB is Wikinson's take on the Strat, though it is slightly downsized, with the horns a bit thinner. Immediately, and by design, it looks like one of the numerous high-end 'boutique' Strat-alikes that are available. Fret-King insists on only using centre-jointed USA alder for the bodies here, not a more random three-piece construction that you'll invariably find on start-up USA Fenders. There's no top veneer either and the wood grain is slightly visible through the oh-so-vintage-looking ice green finish. The Canadian hard rock maple neck, de rigueur for this style, has a slight amber tint that adds class, contrasted by the dark rosewood slab 'board and pearl - as opposed to 'clay' - dots. As with the new American Standard Fenders we get a gloss headstock face and satin back. Again the wire gauge is chunky and very bend-friendly, the well-cut nut is 'Wilkaloid' (a friction reducing compound exclusive to Wilkinson) and overall set-up and detail - on all three guitars - is excellent. The Wilkinson-designed/Gotoh-made vibrato is an update of the original Wilkinson VSV with those distinctive bent steel saddles, but here the baseplate is raised and contoured, making it less vintage-looking, but a smart modern design nonetheless. Along with the slippery nut, the vibrato just pivots on two posts and we get Gotoh locking tuners with height adjustable posts, with the top two tuners just recessed flush into the head, removing the need for string trees. Gotoh hardware is of the highest quality but expensive and illustrates the value, especially of this guitar. Incidentally, there's no face-mount jack 'cup' plate - all three guitars use a side-mounted, circular Electrosocket-style Tele-replacement jack plate that's very neat indeed. While some of Wilkinson's wiring systems can appear a little gimmicky, this is default hot-rod Strat: another nickel-covered PAF-alike at bridge and two slightly hotter-than-vintage Fret-King single-coils hooked up to a standard five-way selector, master volume and tone - no tricks or automatic coil-splits here. On such a familiar platform, there's nothing to get used to - the good weight Super 60 feels like very familiar territory. Sonically too there are few surprises - the bridge pickup sounds a little more earthy than the Eclat's, more chewy and textured, and the single-coils have an attacking edge that can quickly be mellowed either with the tone or just a little volume reduction. The neck and middle combined is nicely hollowed (and the only hum-cancelling combination) and even the bridge humbucker and middle mix sounds admirably Strattastic. A little more woody low-end wouldn't go amiss, however, as the single-coils can sound a little brittle. But the guitar's feel and construction stamp has such a huge effect on the sound and playability that you can't help emulating your fave Strat players. It's the bridge humbucker that really broadens the palette, and with such a good vibrato as this there's plenty of scope for more gymnastic styles - tuning stability is excellent and the vibrato's travel is wide, from nearly a full dump to around a tone up on the G string. Again it brings precious little to the table, but as a journeyman 'boutique' Strat it's the most attractive piece here. From the most soulful SRV to the bluster of modern Townshend, this will get you through most gigs and more.